We are still seeing lower than normal inventory, more multiple offer situations and fewer days on the market which is good for sellers but with prices remaining “relatively steady”, it is also good news for Buyers. Check out the highlights below and send us an email to info@teamrealty.ca for details and info on specific properties, we love to chat about real estate! Members of the Ottawa Real Estate Board sold 2,162 residential properties in June through the Board’s Multiple Listing Service® System, compared with 1,985 in June 2016, an increase of 8.9 per cent. The five-year average for June sales is 1,818. The average sale price of a residential-class property sold in June in the Ottawa area was $434,502, an increase of 8.8 per cent over June 2016. The average sale price for a condominium-class property was $289,905, an increase of 9.4 per cent over June 2016. The Board cautions that the average sale price can be useful in establishing trends over time but should not be used as an indicator that specific properties have increased or decreased in value. The calculation of the average sale price is based on the total dollar volume of all properties sold. Price and conditions will vary from neighbourhood to neighbourhood. 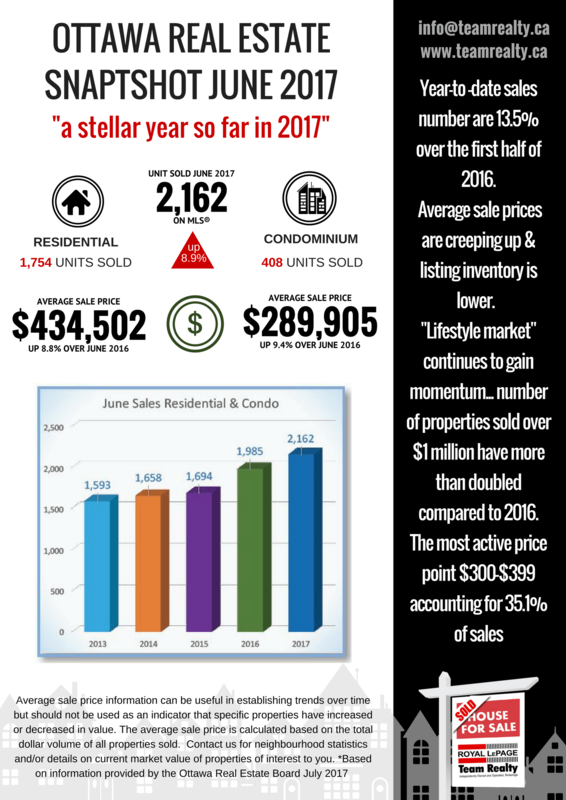 The post “a Stellar year so far”…Ottawa Real Estate Snapshot June 2017 appeared first on Team Realty.